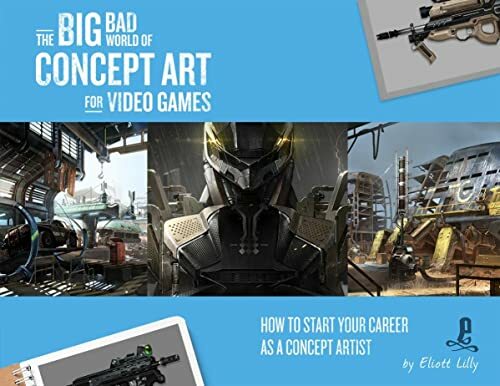 Here's the sequel to Eliott Lilly's earlier book Big Bad World of Concept Art for Video Games: An Insider's Guide for Students that I had reviewed way back in 2015. The first book is a guide on what happens behind the scenes when it comes to having a career as a video game concept artist. The second book focuses on getting that job. The book covers how you can build an effective portfolio, who the industry and studios are looking for, how you can promote yourself, how and where to look for jobs, how to apply for a job, handle interviews, negotiate salary, or when things go wrong, how to leave the company. This book has many checklists with question that you can ask yourself to find out the most suitable job or type of work for you. Eliott Lilly has lots of tips and also share several personal stories and experiences. Overall, this is a rather insightful book but it's definitely more useful to intermediate and advanced artists who are considering a career switch to being a concept artist. If you're a beginner or aspiring concept artist, it's better to get the earlier book to learn more about the industry so that you canset your expectations right. If you're really into having a concept art career, I will also recommend you check out The Ultimate Concept Art Career Guide that I've reviewed recently. That book covers a lot of ground too. I'm not being able to access the "The Ultimate Concept Art Career Guide" link. It's leads to an Access Denied page. Keep up with the nice art supplies/book reviews! You have no idea how helpful they have been for me! Thanks for letting me know. I've just published the review for the other book. It was previously unpublished.